Glass shower walls are a major innovation in bath and shower room design – and they look set to stick around. Seamless, easy to clean, hygienic and fully customisable, glass is the ideal material for a bathroom and will help turn your space into a gleaming spa-like sanctuary. In shower enclosures or wet rooms, our full height panels create a smooth glossy expanse of glass that looks sleek and luxurious. Our glass shower walls are made to measure and are fixed in place with a silicone adhesive, so there are no grout lines to spoil the seamless look or to accumulate dirt and mould. Our perfectly placed cut-outs, made with state-of-the-art water-jet technology, accommodate showers, taps and other fixtures, ensuring a precise, clean-cut finish. Fully waterproof, they will protect your walls for a lifetime and require minimal care – simply wipe them down with a cloth to remove spills and prevent limescale build-up. Behind sinks or alongside baths, our glass panels will protect your walls while adding a polished, high-end feel to your design scheme. Our bespoke wall coverings can allow for awkward corners, sloping roofs, window and cabinets, giving a sleek and immaculately finished result. 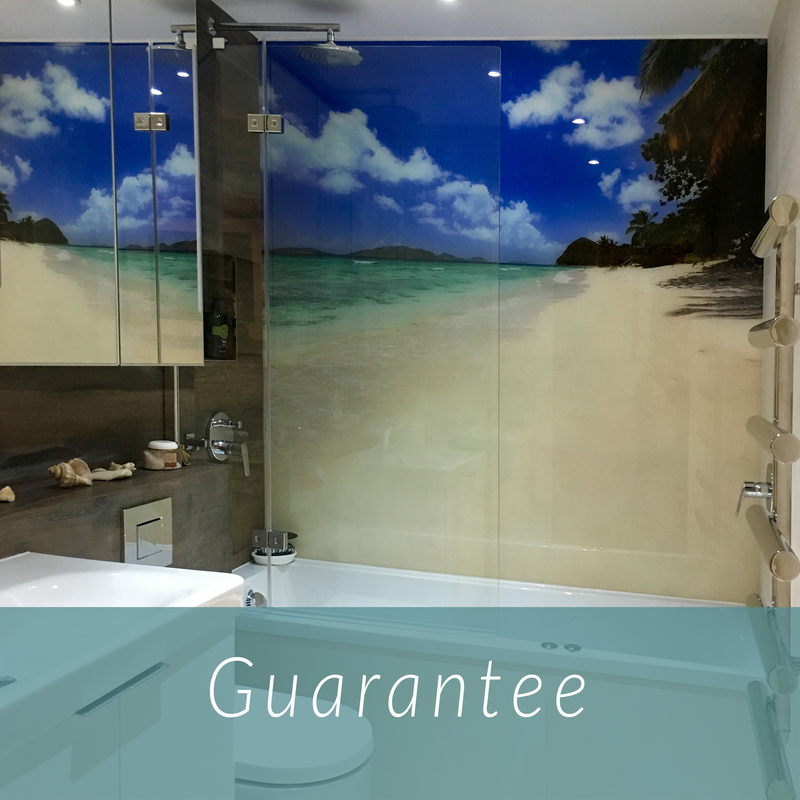 We offer limitless colour choices, special effects and printed images so, whatever design scheme you have in mind for your bath or shower room, we can make it happen. Soothing neutrals, such as white, cream and dove grey, are popular for boutique hotel style rooms, while pretty pastels, such as mint, baby blue and lavender, are instantly relaxing – take it one step further and choose a shimmering metallic option for a truly luxurious finish. If you prefer a bolder look then bright citrus shades of yellow, orange and lime green will be sure to bring a fresh, energising vibe to your space. 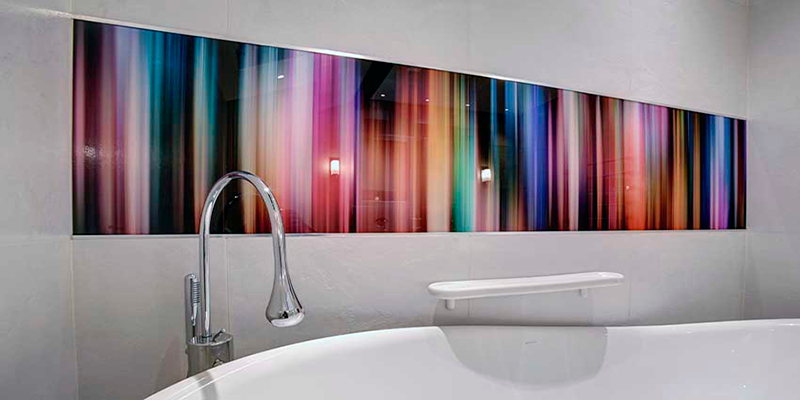 If you’d like to bring some pattern into the mix then we can print any high-resolution image, from neon swirls to delicate florals, onto our glass shower walls or bath panels. We also have a range of tile-patterned glass for a more traditional look, as well as brick, stone and wood-effect finishes. Images of pebbles, shells and underwater scenes are another fun way to add visual interest in a bathroom. For sheer escapism, a floor-to-ceiling image of a stunning beach, ocean sunset or jaw-dropping view will turn even a modest space into a glorious retreat. We’re pretty sure that bathing with a view of tropical palms or Tuscan hills beats grubby grout any day! Visit our Gallery page for further inspiration or contact us to get an estimate or order samples. For information on costing please go to our online price calculator. If your requirement is for a square or rectangular glass panel under 1200mm width x 1000mm height, you can make your purchase online for a speedy 7 day delivery. Easy Glass Shower Walls come in any size – we do not have “standard sizes”, and each panel is cut to order. If a glass panel needs to be cut off square, it’s no problem and at no extra cost! 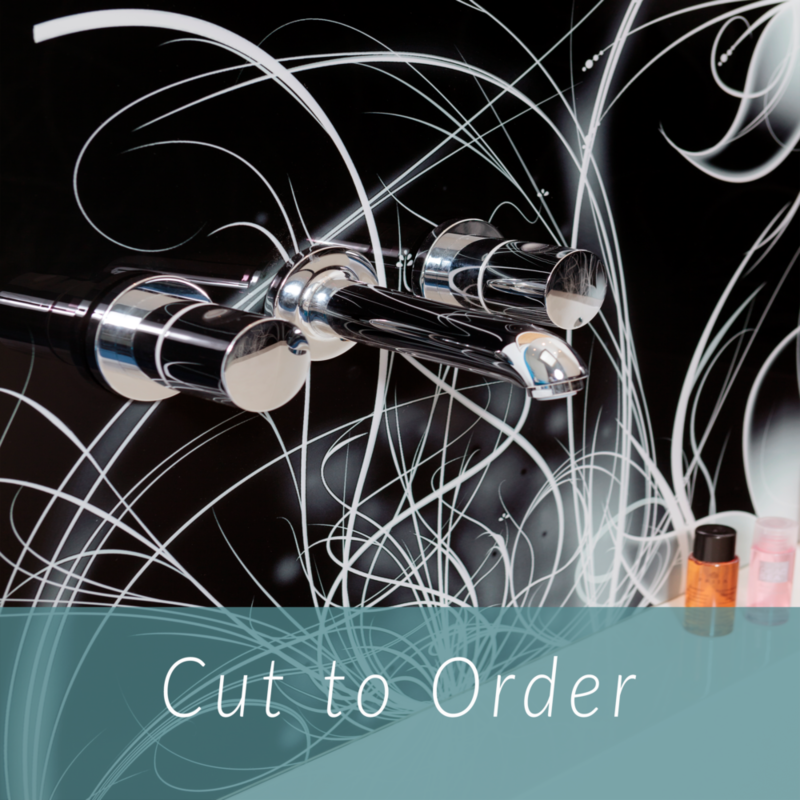 Cut-outs for shower mixers and fittings, even for wall mounted toilet pans, are all part of the service we offer, cut with incredible precision by our in-house water jet cutter. Easy Glass Splashbacks glass shower walls are all manufactured from 6mm low iron, extra clear toughened glass, which is extremely impact resistant. The glass can be drilled or cut during the manufacturing process to accommodate shower fittings and screens. 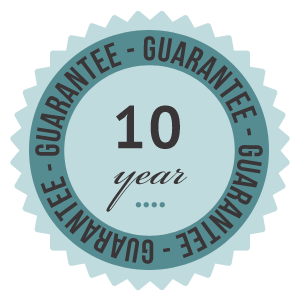 All Easy Glass Splashbacks coloured and printed Glass Splashbacks and Glass Shower Walls are subject to our ten year guarantee against fade or peel. Here at Easy Glass Splashbacks we are dedicated to offering you the best service at affordable prices. We offer many years of experience in the industry. 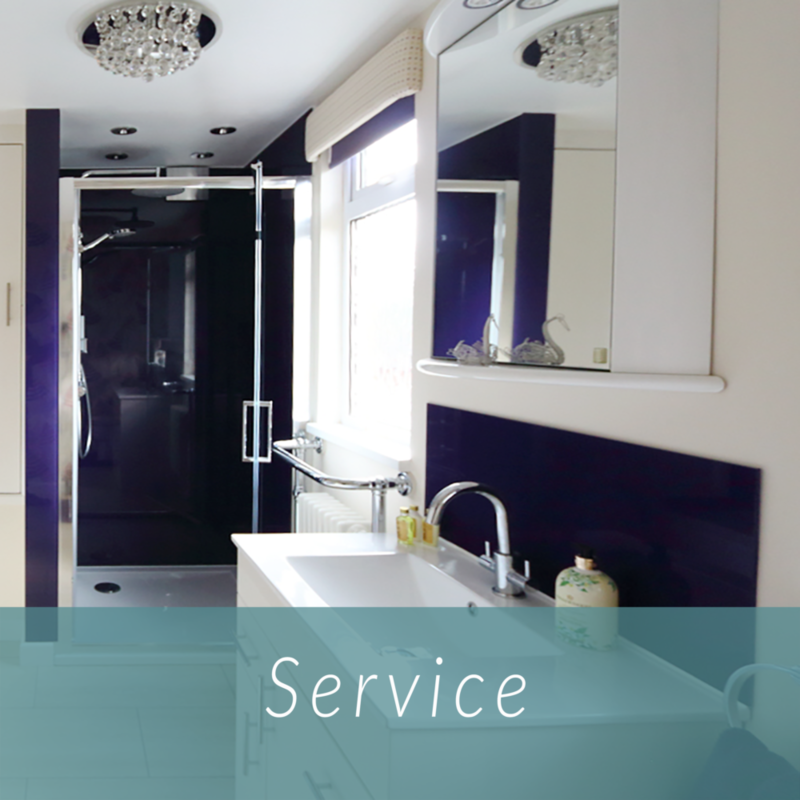 Whether you are looking for supply only of a single bathroom glass splashback, or you want the full service of our experienced survey and fit teams, Easy Glass Splashbacks will go the extra mile for you. We have installed hundreds of glass shower panels and bathroom panels over the years. To have a look at just a selection of these then please see our gallery page for inspiration and ideas.